Why is Global Education a Part of our Program? Part of The Northwood Program's mission is to remove borders by facilitating Global Experiences to create world?ready "Global Citizens". Excel in today’s dynamic "Global Economy"
“With some notable exceptions, our public schools are doing a woeful job of teaching students about the world outside America's borders... These trends have serious consequences. In the 21st century, young people who understand the dynamics of global economic and intercultural relations will have a distinct advantage in securing good jobs. Attending a Global Education focused high school in Los Angeles changed one students life, meet Felix Ruano, a first generation Mexican-American, and first in his family to attend college. Felix grew up in Los Angeles along with his four siblings in a low income family, "Both my parents finished middle school in Mexico and my parents income was in the lowest quintile in the United States" one thing set him apart was his belief that " we are in charge of our own destiny". Felix was fortunate enough to be exposed to many role models which helped him choose a Global curriculum focused high school the, Ambassador School of Global Leadership. Felix states "
Being at an ISSN (International Studies School network) school exposed me to a wide range of intellectual and professional paths. I feel prepared to tackle social and corporate issues in any corner of the world". Felix wants to inspire other students who like him are facing challenges such as "Lack of teachers and administrators that understood the difficulties students face outside of the classroom". His advice is for students to seek mentors "For one, after being exposed to hundreds of role models, my mentors always reminded me that success comes from helping those coming behind you". He also states " Seek out mentors that will challenge you, push you out of your comfort zone, and will do it without expecting anything in return. This is the number one thing. There are people out there ready to lend you a hand but you have to meet them half way". Global Education in our schools is not an option but a necessity: Felix states "Global Education programs like The Northwood Program are ahead of the curve. Students who are able to compete on a global scale are going to be competitive beyond expectation. It's a beautiful thing to connect with cultures 10,000 miles away and to produce value from that interaction will make the world a better place than when you entered it ". 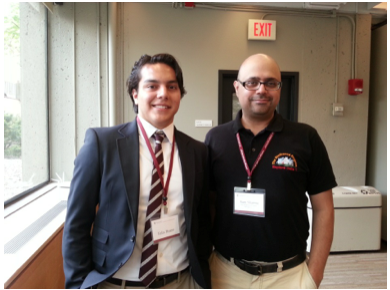 Felix is currently a freshman at Harvard College and always willing to inspire and mentor other students . Besides focusing on college Felix is also involved with non-profit's and passionate about promoting Global Education !